« Sede del Ateneo de Córdoba | Libro Elena Ferrante: "La amiga estupenda"
¡¡TE ESPERAMOS EN LA FONTANA !! It’s time for our weekly paella parties to begin in Fontana pub!!! 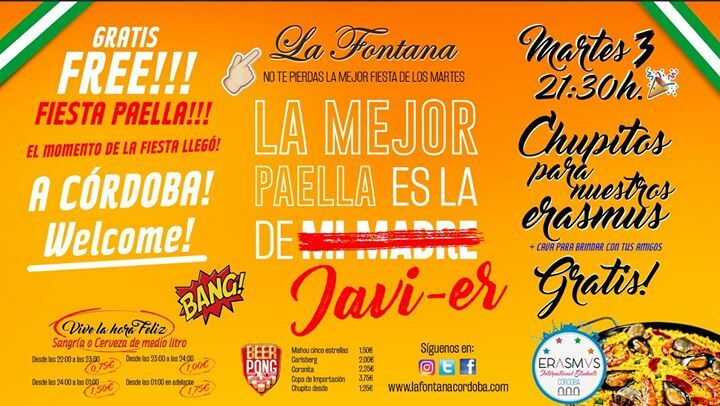 Every Tuesday we offer you a delicious free paella (made by our very own Javi, an EIS coordinator), free shots, free cava, beer pong, music, as well as cheap beer and sangria! !